My Den: Christmas - A Time For Humanitarians. Do you know of anyone or have relatives and friends with dead-beat jobs, desperately trying to obtain small loans or finance to start simple businesses to break out of their poverty cycle but were unsuccessful, as all financial institutions requires either collateral or an income that meets the borrowing criteria? Or have you met or heard of....knights in shining white armour, helping the poor with small loans to start simple enterprises, loans with easy-to-meet criteria and repayments terms? What about a story of a man who with just US$27 and through his beliefs and vision, started a revolution and created an institution that lifted millions of people out of poverty in the Third World through micro-loans? Christmas, besides saints like Mother Teresa, is also a time for remembrance of humanitarians like Dr. Mohammad Yunus. Born on 28th June, 1940 in the village of Bathua, in Hathazari, Chittagong, in what was then Eastern Bengal, Mohammad Yunus was the third of 14 children of a successful goldsmith father. His father, believing in the importance of education, sent him to the United States where he graduated from Vanderbilt University with a Ph.D in Economics in 1970. He returned to Bangladesh in 1972 and took a chair in economics at the University of Chittagong. But it was his mother, Sufia Khatun, with her generous spirit of helping the poor, who was his biggest influence in his early childhood years and inspired him to a lifelong mission of helping the poor and the eradication of poverty. In 1974, a time of famine in the country, Dr. Yunus led his students on a field trip to Jobra, a poor village in Bangladesh where they came upon a woman who struggled to etch out a living by making bamboo stools and learnt that she had to borrow capital, at outrageous repayment terms, to buy the raw bamboo for the stools she made. After repaying the usurious loan, she was left with just a penny profit margin, barely enough for subsistence. Shocked by the poverty surrounding him and the struggles of the poor, he realised that something is terribly wrong with the economics he was teaching, "What is the point of all these splendid economic theories when people around me are dying of hunger?" he asked himself. Yunus took matters into his own hands and lent US$27 dollars out of his own pocket to 42 craftsmen in the village, telling them that they could pay the money back when they could afford to. He found out that with tiny loan amounts and the removal of usurious repayment terms, it was possible to not only help the poor and give them a chance to survive, but also create the spark of personal initiative and enterprise necessary to pull themselves out of poverty. He decided that there have to be an institutional solution and hit upon the idea of a bank for the poor. Going against banking wisdom that loans to the poor are not viable and against the advice of many banks, government officials and even threats from violent radicals and warnings from the conservative clergy, Yunus's persistence finally secured a loan in Dec 1976 from the government-owned Janata Bank to start lending to the poor in Jobra. On Oct 1, 1983, what began as a pilot project to help the poor with micro loans became a full-fledged bank - the Grameen Bank, a bank for the poor. Mohammad Yunus reversed conventional banking practices by removing the need for collateral and provided credit to the poorest of the poor in rural Bangladesh to start simple enterprises, and created a banking system based on mutual trust, accountability, participation and creativity. By 2206, in Bangladesh alone, Grameen has more than 2,200 branches serving 6.74 million borrowers in over 72,000 villages, 97 percent of whom are women. With more than US$6 billion in loans dispensed, Grameen boasts of a repayment record of over 98 per cent, a recovery rate higher than any other banking system. 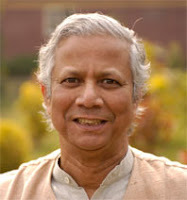 Dr. Mohammad Yunus efforts in eradicating poverty did not stop with Grameen Bank. In the late 1980s', he started major social projects aimed at increasing agricultural yield and productivity for the thousands of peasant farmers like the Grameen Agriculture Foundation, Grameen Fisheries Foundation and Grameen Telecom. Projects like the Village Phone has brought cell-phone ownership to 260,000 rural poor in over 50,000 villages since the beginning of the project in March 1997. With more than one billion people in the world living on less than one US dollar a day, the struggle against poverty is an existential struggle for survival. Through the granting of micro-credit, Dr. Mohammad Yunus has helped millions of the poor get out of the poverty cycle. He has given the poor a chance where none have existed before and promoted entrepreneurship that puts the poor, especially women, in the control of their lives. Even beggars are not turn away from Grameen bank as he firmly believes that alms destroy initiative and creates dependency. The story of Mohammad Yunus and the success of the Grameen initiative not only shattered stereotypes about the poor but also proves that the poor and disadvantaged are no different from you and me, they just needed to be given a chance. It is an inspirational story of how so simple an idea could have worked so well for millions of poor around the world. Dr. Mohammad Yunus's tireless humanitarian efforts in eradicating poverty and uplifting the lives of millions of the poor have been widely praised and acknowledged, and has won many awards including the Ramon Magsaysay Award, the World Food Prize and the Sydney Peace Prize. Along with Grameen Bank, he was also awarded the Nobel Peace Prize in 2006 and is the author of Banker To The Poor. The success of the Grameen model of microfinancing has also inspired similar efforts in hundreds of countries throughout the developing world and even in industrialized nations, including the United States, Canada and France. ".....at the rate we're heading, we'll halve total poverty by 2015 and create a poverty museum in 2030," - Dr. Mohammad Yunus. This is the second of my "Christmas Celebration Series" - a celebration of the human spirit. What an amazing man! It just goes to show what someone can achieve when they think outside the box. Yes, Yunus was an amazing man.Besides being passionate about helping the poor, his Grameen Bank has broken long-held sterotypes of the poor being less credit worthy. This alone has help thousands in other industrialised countries seeking micro-credit to start simple enterprises to raise their standards of living. Thanks for popping by. Happy holidays.